Fig. 4. Perineal rectopexy. The prolapse is reproduced, and a full-thickness circumferential incision is created through the rectal wall. Once the colon has been maximally delivered, it is divided along with its mesentery, and a one-layer anastomosis is created to the distal rectal cuff. Prior to anastomosis, plication of the levator ani muscles is performed and posterior suture of the mesentery to the presacral fascia are accomplished for further fixation. morbidity are minimized. With the patient in the lithotomy position, the prolapse is reproduced and a full-thickness circumferential incision is created through the rectal wall approx 1 cm proximal to the dentate line. The rectosigmoid colon can then be further prolapsed. Once the colon has been maximally delivered, it is divided along with its mesentery and a one-layer anastomosis is created to the distal rectal cuff. 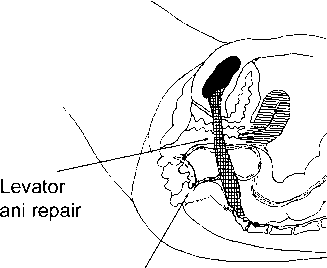 Prior to anastomosis, plication of the levator ani muscles is performed and posterior suture of the mesentery to the presacral fascia are accomplished for further fixation (Fig. 4). 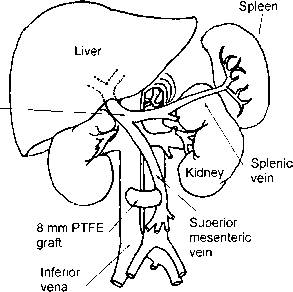 Postoperatively, patients resume a diet immediately and are discharged within 1-2 d.